The strength of Ashent's progressive metal comes from several components. The first is the breadth of their song composition where Ashent can be heavy and foreboding as on 'Ephemera' or light and moody as on 'How Could It Feel Like This' and the following instrumental, 'Ebb and Flow of Aware.' Actually, I would venture that these are more prog rock than metal; they are also the finest tracks on 'Deconstructive.' Yet, within this fine characteristic, I found a lingering dilemma: while pressing towards greater creativity, Ashent seems to have tried to hard to be 'progressive.' The breadth of their creativity lead to my monotony. Actually, it took several starts for me to get through this work because there is almost too much here to absorb in many songs. The foremost component may be the vocal arrangements which are often varied, yet always clear and memorable, as on the opener 'Sinking Beneath' or the later, 'Cassandra.' There are not typical vocal harmonies, more harmonic dissonance. However, this exceptional component is also the root of another flaw. Ashent attempts, by experimentation mostly, to bring melodic death or dirty vocals into several songs. Where most noticeable, they fail miserably. A case in point is 'Imperfect' where Ashent invokes, most horribly, the death vocals common in modern American metal. Another attempt is found in 'Starlinked Innerness,' an otherwise exciting and more heavy prog metal piece, which is nearly destroyed by most ludicrous death metal vocals. Thankfully, they're brief. I can't say this sincerely enough: guys, this isn't a strong point for you. In the end, on 'Deconstructive,' Ashent succeeds in their quest to bring their own brand of dynamic and creative progressive metal to the arena. Even if it is, at times, quite over-whelming and infected with a poor, but minimal, use of death vocals, Ashent is on to something quite good and a bright future. 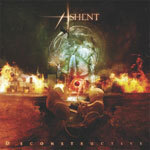 On 'Deconstructive,' Ashent succeeds in their quest to bring their own brand of dynamic and creative progressive metal to the arena. Even if it is, at times, quite over-whelming and infected with a poor, but minimal, use of death vocals, Ashent is on to something quite good and a bright future.